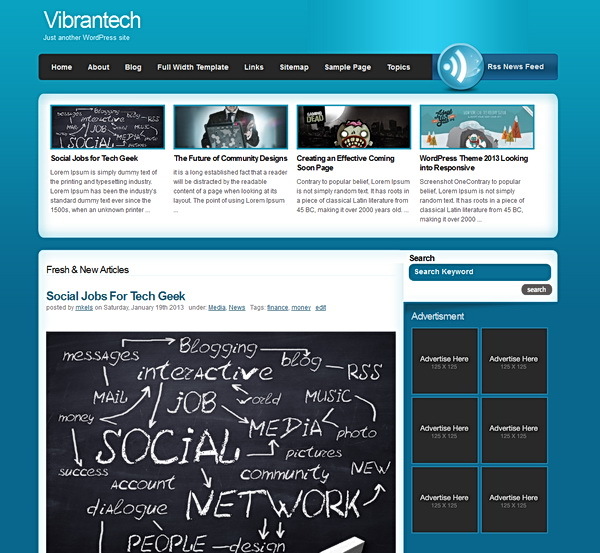 VibranTech is a two columns lime blue WordPress theme with four featured content frontpage. 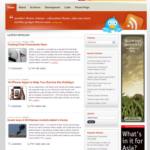 This theme is suitable for personal blogs devoted to technology and news. The four featured columns on top is best to present your featured articles or popular news to quickly catch the attention of your readers. VibranTech also comes with widget-ready and thread comment ready functions. This theme was tested and compatible with Firefox 2, Firefox 3, Safari, IE7, IE6 and Opera. Feel free to download and use it and please keep the footer intact AS IS. Thanks for the great theme again! now i am inside theme function. without instruction i dont see how ppl gonna use it. Please download the theme again. I did a minor changes to fix the bug. Please try it and let me know the result. Thanks. Awesome, now its ok, so for featured image we need to add custom field “feat-img” and for editing flicker we need to edit side bar, change the user value. Thanks Michael, its a great and beautiful theme. Now… can u tell me how can I put an image in header please?. Thanks again. Do you mean the featured content image? If yes, please use custom field ‘feat-img’ to point to your image location, it will automatically crop and display it in proper size. I cant get it to work on my site…. Is it ony to write the url in the value field? Or do I need to have the image tags also? Yes. Put ‘feat-img’ on your post custom field name and the url of the image on the custom field value..Press the ‘Add Custom Field’ button to update it. Had error message from the functions.php file [had to convert to php5 to correct that]. Categories is not aligned properly and is slightly low. What to do I do about this? Please redownload the theme. delete the previous one before uploading it again. By the way, how to change and manage the featured post section? Or is it the latest post only that will be featured there? I can’t find any theme options there? Just edit the sidebar.php, look for the advertisement section and replace the ‘#’ with your sponsor url and replace ‘ads.gif’ with your banner image name, make sure your upload the banner inside the image folder of this theme. I don’t understand how to get the featured content working. If anyone could help me that would be awesome, as this theme is brilliant. Please refer to this post . I downloaded the theme yesterday, and footer.php had spam injection in it. I tried it again today (twice) and one of the downloads had your footer, like I would expect it to be, with your details and a comment asking not to modify it. The other download has this spam injection again. It’s not a spam injection. It is only encrypted code to protect the link. I love this theme. I fell inlove with it the first time I saw it, but I am having trouble about the sidebar right now. Everytime I add widgets, the ad boxes disappear. What could be the problem? and is there a way for me to add adwords below the post? Please redownload the theme. I had fixed the ad boxes disappearing when using widgets. Regarding adding adsense if that what you meant, you’ll have to manually add the adsense code on the post. I hope it helps promote your beautiful theme. I am having the same problem as many others–the featured images! I have read your earlier comments and I have added the ‘feat-img’ category to include the url. I have also looked into the ‘feature.php’ to insert my category name….still nothing. Any help is truly appreciated, I really want this template to work! 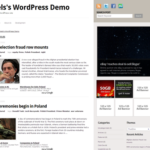 Thanks for creating one of the best themes currently available for wordpress. I’ve been having a problem with the ‘featured’ section. I opened featured.php. I entered the category name I wanted displayed in that section. However, it seems to be displaying my last 4 posts regardless of category, is that correct? Also, I can’t get the individual images to show up. I created a custom field called feat-img within the post of one of the featured articles. Next I placed the full url of the image I want displayed in the ‘value’ section. The image doesn’t display. Any advice? Nevermind, I had to download the latest version.. sorry for bothering you. You rock bro!!! Is it possible to make the headlines on the frontpage so only the first letter is large? Very nice theme and works great in 2.8. Thank you! Can you tell me how I would get dynamic tags to work or what code needs to be put in? Thank you again. @Richard… good to hear that it works in WordPress 2.8. The theme looks fantastic, I might give it a go. @Michael… is this theme good for SEO? Thanks for giving us the theme and judging by your comments, a lot of your time. Great! I like the colour and layout of this theme. i love this theme. I wanted to add an image to the header with the logo of my blog. How can I do that? Awsome theme. I love it. Does any one know how to show excerpts only on front page and not the entire blogposts? thankyou for your free theme! Hi. I love the theme, but there is a smap link appearing in the upper-right-hand corner and I can’t seem to figure out where it is coming from. Any thoughts? hi, how do you delete the ads area on the right? Out of a million themes, I finally chose this one. I really like it. I’ve got a couple of questions. Number one, is it possible to change the size of the picture image that’s shown in the featured content? It’s not formatting my pictures, they’re rectangle shaped. Also, my blog is new and I only have like two posts, but there in two different categories and both of them are showing up in the featured content, which is fine. But if I’m understanding correctly, if I don’t want the last four posts showing in the featured area, I should go to the featured.php page and put in a specific category that I would like to post my featured posts into. I was wondering if there’s any way to change the “bookmarking” features at the end of each post. I wanted to add a facebook and twitter one. I have a problem with “reply” button. When somebody tells something and I want to respond I have to write another comment and not to reply it! I see that in your comments, your reply button, works very well. That red reply button! the reply button should be working..you can check out the demo. did you setup the dashboard > setting > discussion to and enable nested comment etc. wow… great theme.. thanks Micheal. Now there are just too many to choose from. I just need to pick a theme and go with it. hey guys, i wanna do a ict fair, anyone could help me to think of the theme of the ict fair? i really love this theme. Thanks for sharing. Awesome Theme i was Looking for it From Years ! Where can i find the option to set up the advertisement widget? I can not find it in the widget section in wordpress. How can I make changes to the ads in the sidebar? I’m interested to learn how the top featured articles are populated. I had assumed that there was a widget, but can’t find anything in admin? Good morning, and thank you for a really great looking theme. I just activated it on http://pool-water-testing.com/pool-testing-blog/ and have a question: Why do the “height=” and “width=” attributes in my “img src=” calls no longer work? Thanks for sharing. Thank you very much.